ST. PETERSBURG — June is Men’s Health Month and time for us to take a real look in the mirror and step up our game-plan for better health. Too many of us have a brother, son or grandfather dealing with a major health issue. Younger guys might feel good and untouchable, while older guys might think they can resolve the issue by giving it time to “go away.” But, a health crisis can hit us at any time. If we want to be around for our children and families, brothers we need to change. We have to eat right, get in shape and get check-ups. We can do this! “We’re hard-headed. We don’t want to take time off from work to see a doctor. We need tough love,” said Charlie Colquitt, PharmD, a speaker for the upcoming Empath Health African American Men’s Health Forum in Clearwater on June 30. 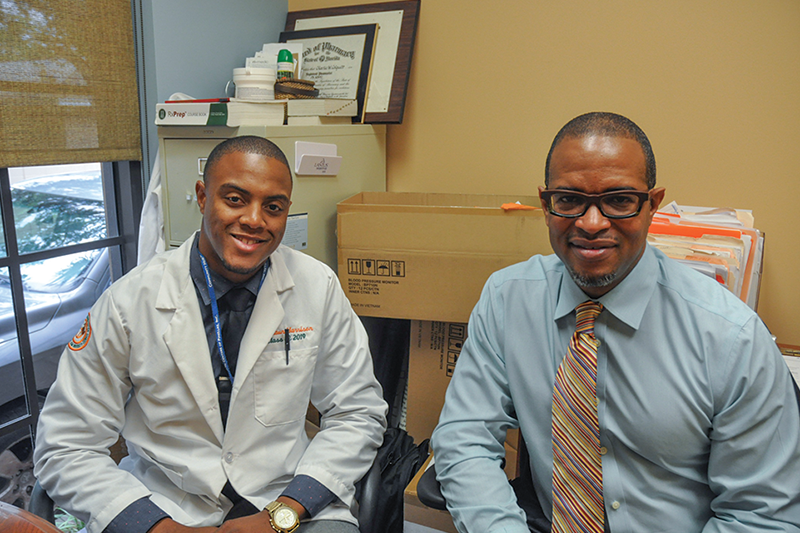 Colquitt is a clinical pharmacist at the Community Health Centers of Pinellas at Johnnie Ruth Clarke campus in St. Petersburg and an associate professor of pharmacy practice at Florida A&M University (FAMU) in Tampa. He treats patients, teaches fourth-year pharmacy students, works with a pharmacy student on a diabetes management project, as well as conducts grant-funded research on hypertension and medication management. Screenings, testing and lifestyle modifications can all lead to prevention. “I’m a huge proponent of preventative care. Go see your doctor. You wouldn’t believe how many people have not seen a doctor in their life and men over 55 who have never had a prostate check,” Colquitt explained. This care can be life-saving. Barriers may be distrust with the healthcare system, medical costs, no transportation or even mindsets of the young. At FAMU’s annual workshop, they often discuss how the younger generations feel they have more important things to do than be concern with their health. They think they are young forever and don’t have to worry about their health even if they have a family history of diabetes, hypertension or prostate cancer. “Annual numbers (glucose, blood pressure, body mass index) and weight are basic things that can account for a lot of problems that could happen down the line,” Colquitt said. Eating a healthy diet is vital. “African-American men typically have a high salt diet. Try to choose fresh vegetables and meats and cook your meals, so you can control the amount of salt and seasoning. Learning how to read a label and understanding serving sizes opens up a lot of people’s eyes,” he explained. When healthy options aren’t available, or it’s difficult to give up favorite foods, adjustments can be beneficial. For instance, if you eat chips and drink sodas, which contribute to weight and disease states, and you also like fried foods, just don’t eat as much. Also, getting exercise makes a difference. Colquitt advises to start small with just walking around the block and gradually working your way up to 30-minutes three to four times a week. “Those simple things can make a dramatic impact,” he said. Take the first step by joining Colquitt and other healthcare professionals at the African American Men’s Health Forum on Saturday, June 30 at Suncoast Hospice | Empath Health Service Center, Gathering Place 5771 Roosevelt Blvd., Clearwater. Men ages 14 and older are encouraged to attend this free event.